I have family and friends that raise up and breed the breeds you see on this page. I help them sale the pups on this site. You are welcome to call to get their phone number to contact them about visiting the parents and see how the pups are raised in their homes. 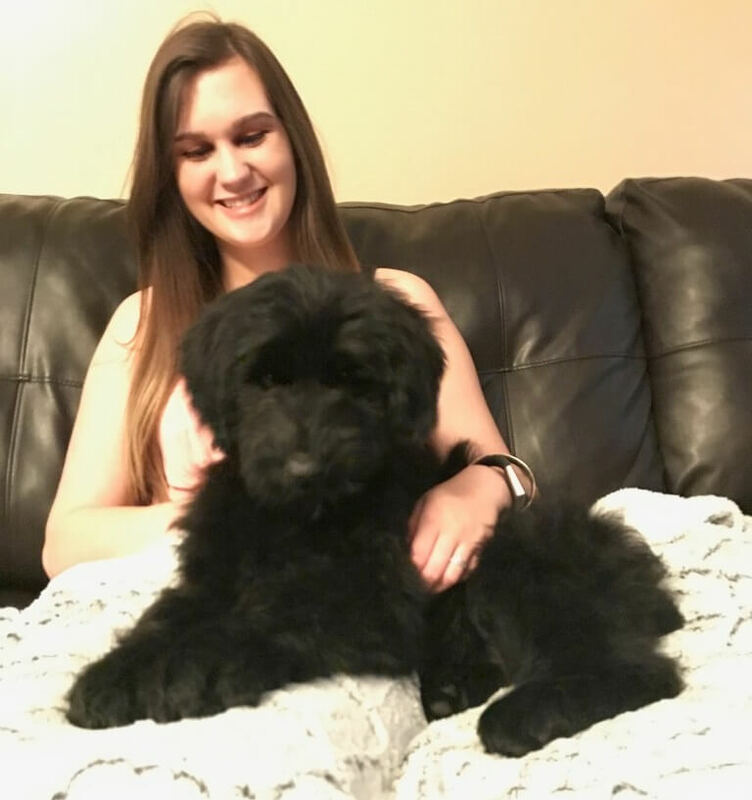 All our Poodle and Poodle mix puppies come with potty training started and many are already completely trained to use the PUPPY APARTMENT. Please read the TRAINING PAGE about this wonderful potty system for your tiny puppy. This page is dedicated to our Poo Mixes… Most the info is on Cockapoos because that is the breed our group first started with. You are welcome to contact me to discuss personalities, health, and train-ability of other crosses. In my experience you just can’t go wrong mixing something with a Poodle! These parents are raised in family homes and we also stud out our males and help those families sale their pups as well. All parents are very nice top quality dogs and are beloved family pets. We can always send you parent and breed info on any of our AVAILABLE puppies. 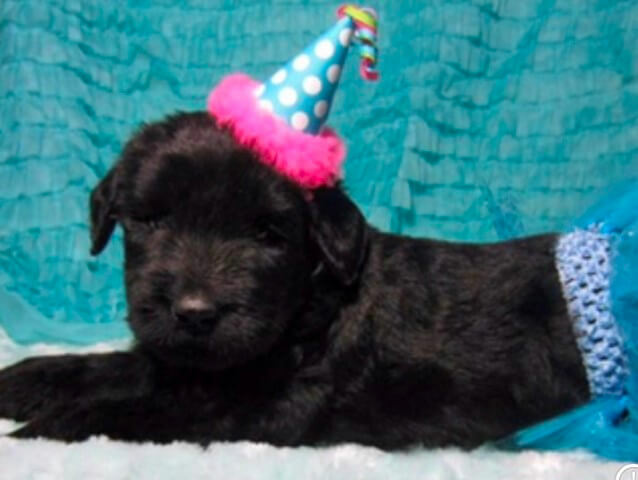 Please email your request and always ask about a puppy by his / her name on the AVAILABLE POOMIX puppies pages. We believe in hybrid vigor which is achieved by mating two dogs that have diverse back grounds. This introduces new genes to the genetic stew which insures very healthy offspring. So you can rest assure that your puppy will come to you as happy and healthy as can be. 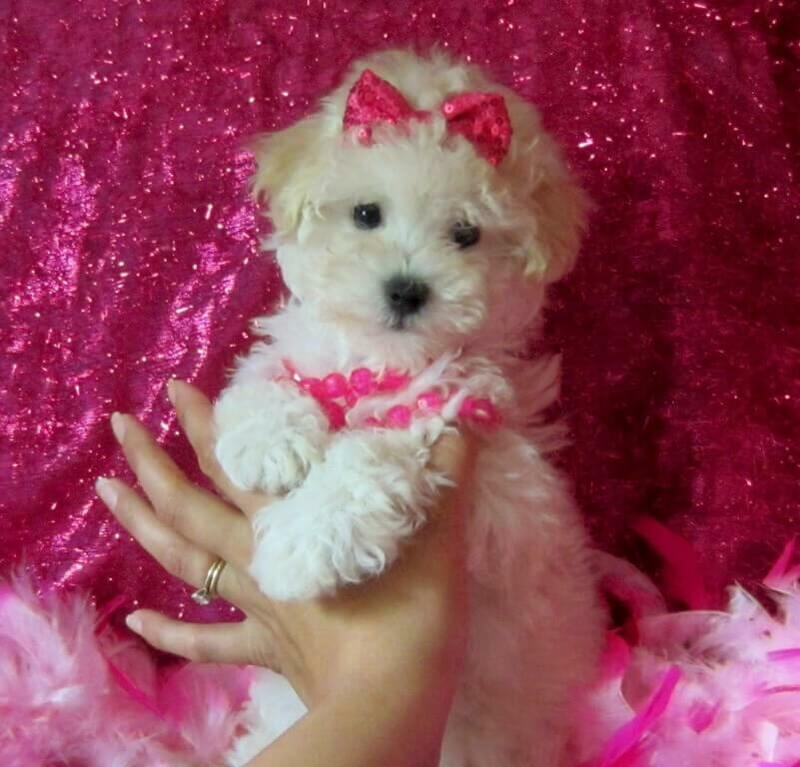 We are well known for having very nice Cockapoos because we do not just throw two dogs together but search long and hard for the perfect parents that will complement each other and have small, short nosed soft coated, fluffy Cockapoos that do not look like terriers like other breeders’ Cockapoos do… (ABOVE), is a picture of one of our Chocolate Cockapoos as an adult and is what you can expect a Cockapoo puppy from us to look like as an adult. 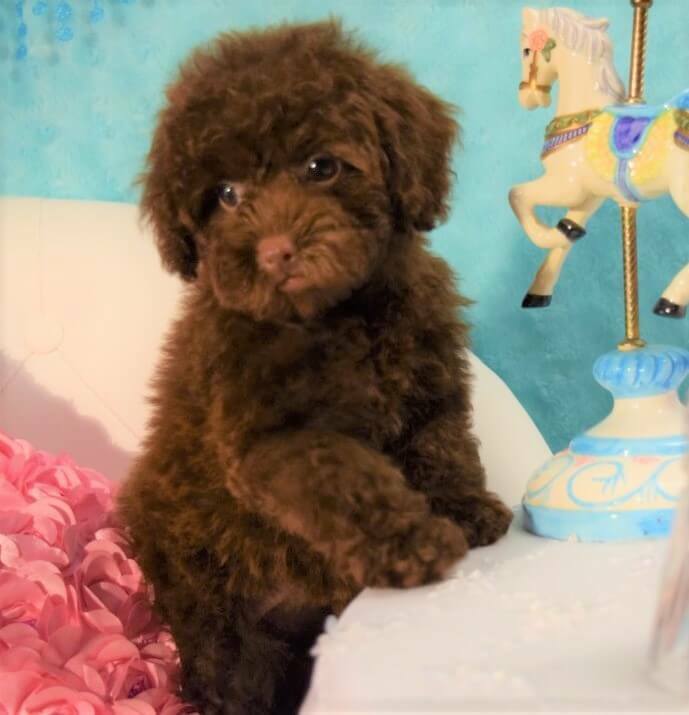 We breed our small 11-20 pound Chocolate, black, buff, red and parti Cocker and Cockapoo dams with our tiny Poodle studs to get these small Cockapoos. 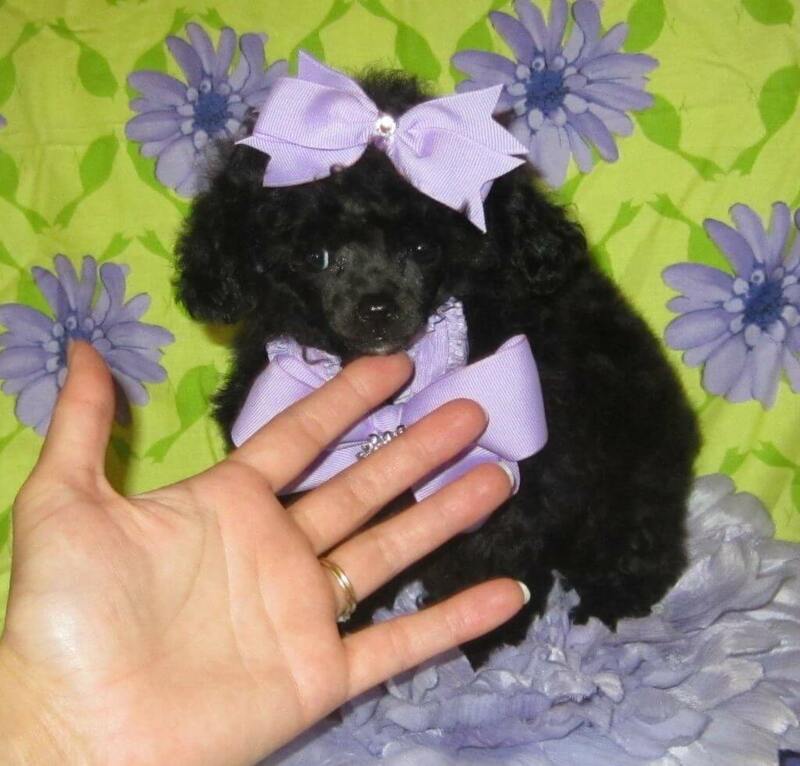 We also breed Female toy Poodles to a small Cocker Male for small Cockapoo puppies. 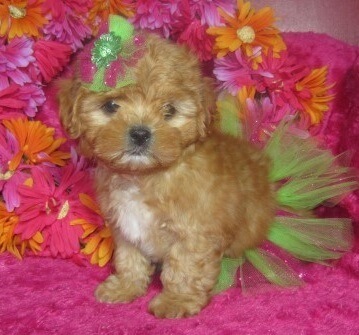 We have some gorgeous Cavapoo puppies as well. 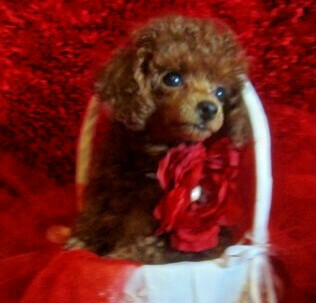 We have a male Cavalier we breed to Poodle girls as well as Cavalier girls we breed to our tiny poodle studs. Our pure breed studs are AKC registered and our personal females are also registered if they are a pure breed, and puppies may or may not come registered with a hybrid dog club such as ACHC, so if this is important to you then ask when you inquire about the puppy. We have been registering less mixed breed litters because people just don’t need it for a mixed breed puppy. In fact we haven’t registered a mixed breed litter since 2014, but if you absolutely MUST have registry papers I may be able to get them for a small fee so just ask. 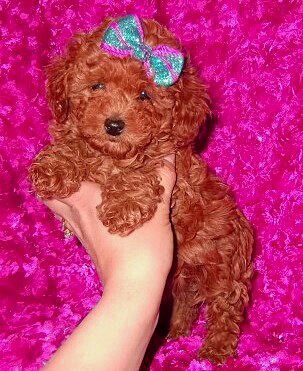 We also breed f1b mixes which would be ¾ poodle to get a tinier size or a color like dark reds. 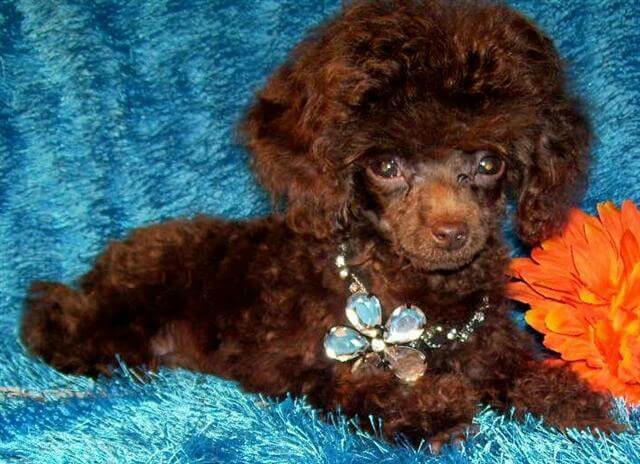 I have heard many breeders say you can’t breed a tiny toy or teacup Poodle with a Cocker Spaniel and that may be true with their breeding stock, but not with ours. Our Cocker females are small, and our Poodle studs try and try until he (gets lucky). Then we hold and pet our our dam so she does not move around to much and accidentally hurt the little guy. Yes it is a lot of extra work breeding dogs that are two different sizes and many breeders do not want to be that hands on with the breeding process. Most of our puppies are on the smaller side of around 9 – 11″ tall and 8 to 15 pounds full grown… But they can have puppies of 4 pounds full grown on up to 25 pounds full grown, do to genetic throw back, so ask about the size of a puppy if you are interested in him or her. 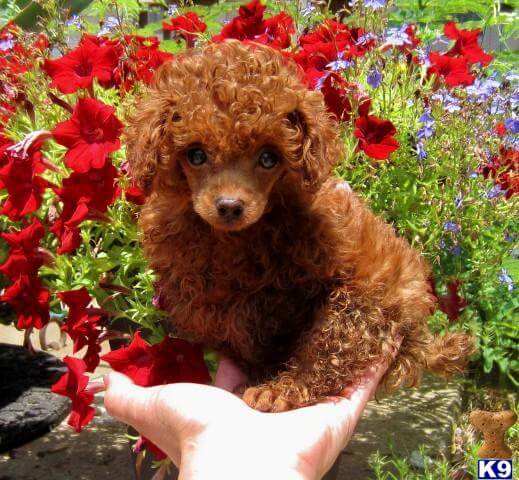 If you want a small dog that is not as delicate as a toy poodle but still has that non shedding, hypoallergenic coat and winning personality, You’ve found it in this breed. 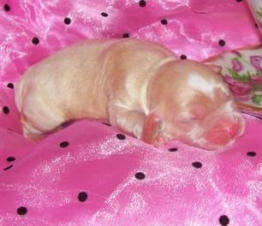 Contact me for pricing on a specific puppy if it is not listed on that pup’s page. Our personal dogs come with dew claws docked and tails docked, but very often we do get some with long tails from those who use our studs and chose to keep the tail long.. If you want a puppy with a long tail from one of our personal litters you will need to let me know before the puppy is 3 days old. Look on the PUPPY CARE page on info on tail docking and dew claw removal. 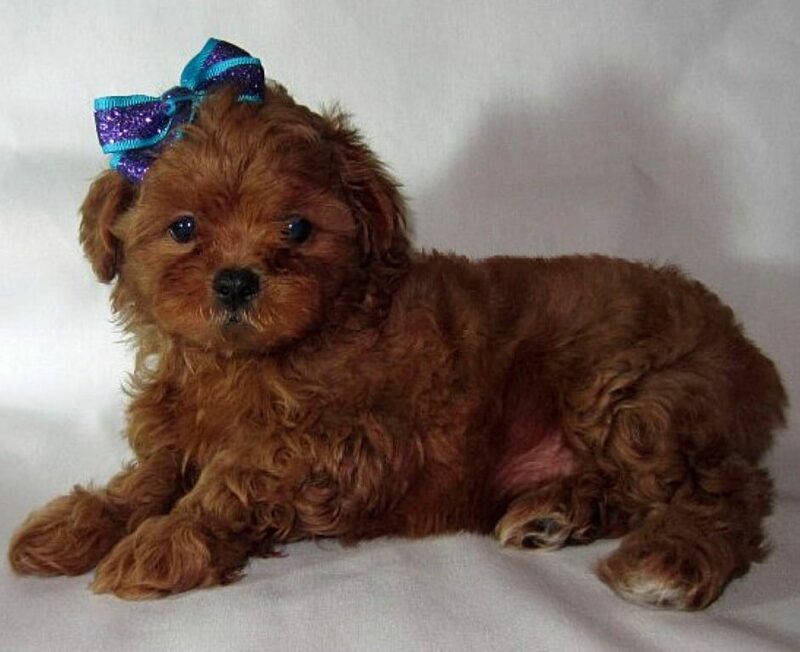 Size estimate: Puppies usually gain about 5 oz a week from 6 weeks to 8 weeks of age. You can multiply the 8 wk weight X 3 and then 4 to get a low and high range on what your Cockapoo puppy will be full grown. Or if you wait until 14 -16 weeks of age you can just double the size. Another formula used for toy sized dogs is double the weight at 6 weeks, then take that weight and double it again. 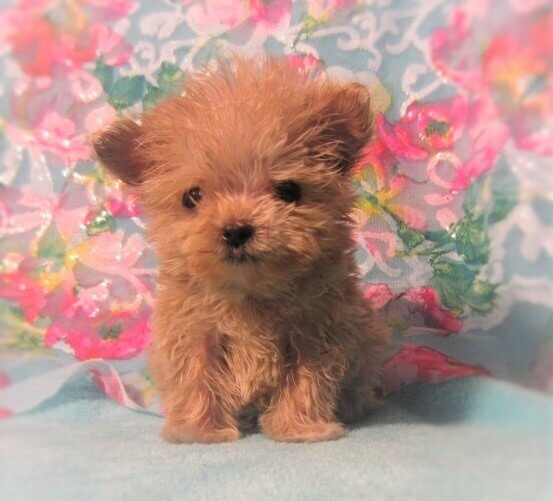 So if a puppy is 2lbs at 6 weeks it would be a 8 pound dog full grown. This is just an educated guess since puppies can grow at a different pace from each other. We get Teacup and Toy sized Cockapoos and Cavapoos, and also mini and standard sizes on occasion. 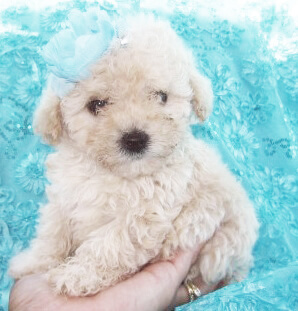 In Yorkipoos and Maltipoos we get smaller sizes like Teacup and toys. Puppies that chart to be extra tiny: We are known for our healthy extra tiny puppies. All our tinier pups come with care instructions for a tinier more fragile puppy. Make sure to follow all instructions. 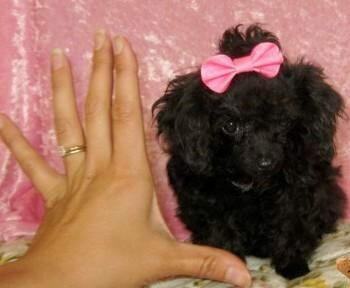 We do not guarantee a puppy will be the size it is charting at time of transfer to be the adult weight when full grown. If a buyer says they absolutely have to have a certain size I tell them to look for an adult then. That is the only way to be sure your dog will stay tiny. I am not interested in selling to someone that is going to complain if their pup ends up bigger than it charts. 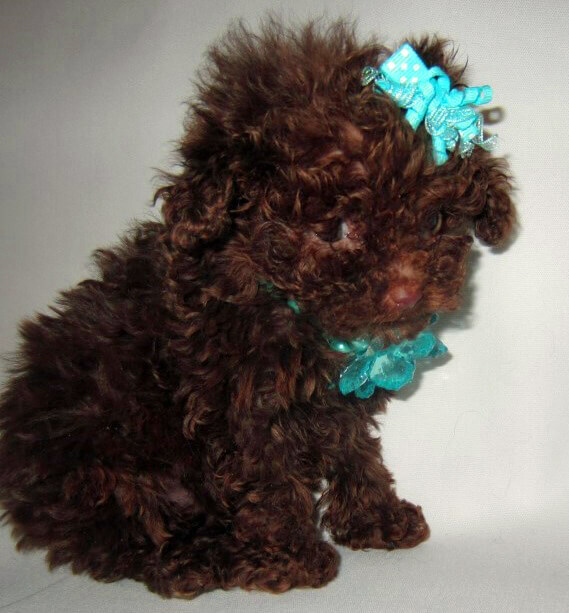 Poodles and poodle mixes can even end up bigger than their parents! 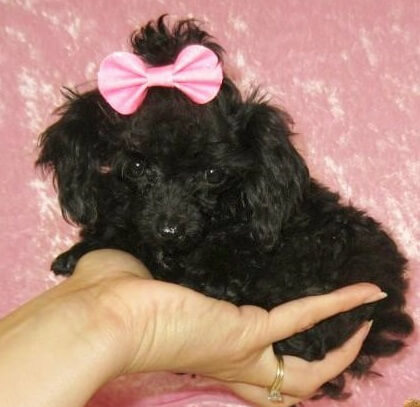 Why: because Toy poodles were bred down from standard sized poodles and absolutely any poodle or poodle mix can end up being bigger. The toy breed weight charts are accurate about 80% of the time. Size and color change is a risk you take when buying any puppy and NO breeder is going to guarantee that. Our Cockapoos are of the best quality and if you are a breeder you will find the tiny size and superior health of their genetic lines to be an invaluable addition to your breeding program. 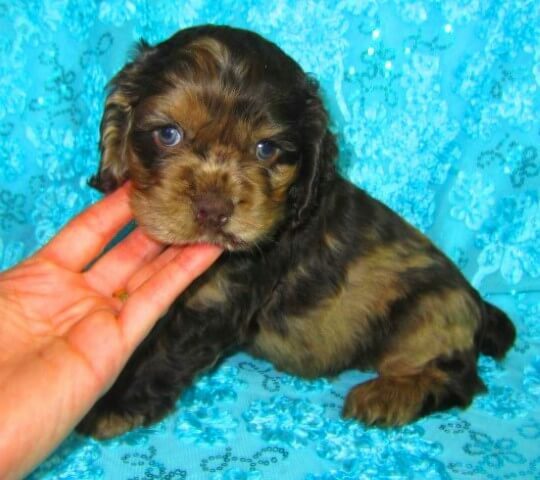 Of coarse if your Cockapoo is just going to be your family pet please have it spayed/neutered for it’s own overall health and wellness… You can see past Cockapoo puppies on our Past Puppies Page. 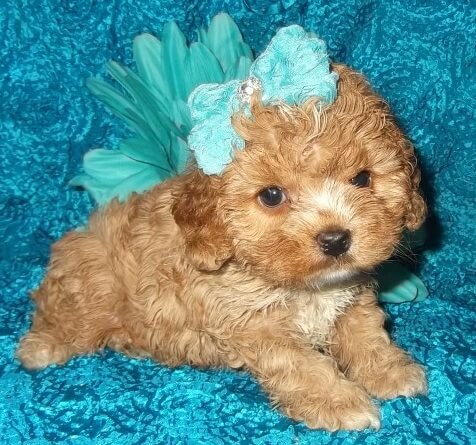 If you have been searching for a Cockapoo puppy for very long you may have become confused as to what a Cockapoo really is and how different generations of Cockapoos can have an effect on your resulting pets general appearance. You may have see F1, F2, F3, F1b, F2b etc, and really not know what those letters and numbers mean. If so, go to bottom of page to view article. 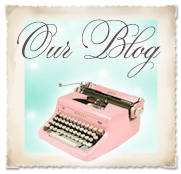 In it we explain why we only breed F1 and F1b and why we are so picky on what type of Adults we will breed together to make our gorgeous puppies. We also breed 3 way crosses on occasion with maltese to get more of the tinier teddy bear look. These pups are just as healthy and great tempered as the Cockapoo. We do not have a set price range for our mixes. We look at coloring and overall quality as well as other factors such as availability when placing a price on a puppy, so a smaller puppy can be cheaper and a larger pup more expensive. Prices may reduce if a puppy is still available at an older age. Size: Since a Cockapoo is of a stockier build than a teacup Poodle a teacup Cockapoo, although the same height, could be heavier in weight than the teacup Poodle. That is why a Teacup Cockapoo can be up to 10 pounds and still be under 10″ tall. 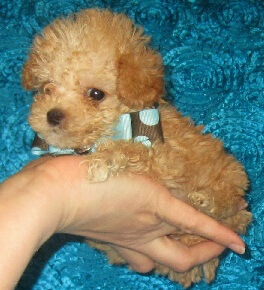 Some Cockapoos may take after the Poodle breed more and may end up being small framed and be more like a teacup Poodle size full grown. 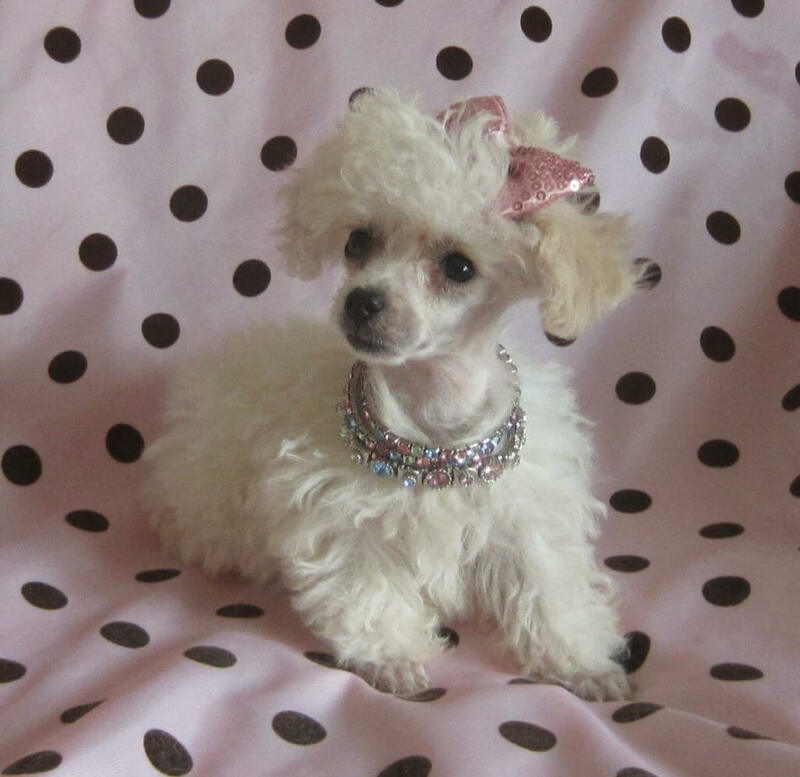 They can also have the height of the Cocker and thin frame of a Poodle… Most our Cockapoos run in the teacup to toy or smal mini range and are 15 pounds or less full grown… We also strive to breed for a certain look : the Look of a very small Cocker with a fluffy hypoallergenic coat. 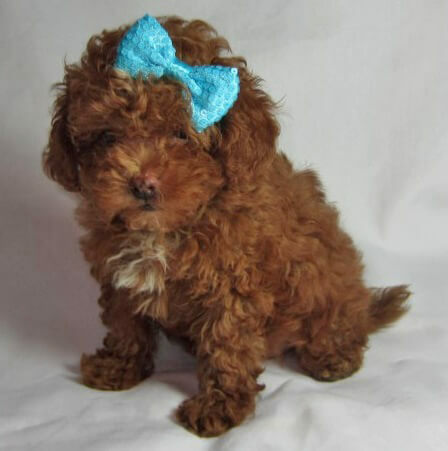 We find this is what most Cockapoo buyers want and we believe the features like the smaller size, shorter nose, and hypoallergenic coat is the best looking Cockapoo. You can only get this from breeding a short nosed teacup Poodle to a short nosed American Cocker Spaniel that is a smaller size. Puppies can have different degrees of coat curl but coat should be fluffy at least or have a Cockapoo curl, which is not as tight or cottony as a full bred Poodle’s coat. You can always call me to discuss individual puppies I may have for sale. MOMS, Here are a few of our Cocker Moms. DADS, Here are a few of our Poodle studs. Feel free to contact us at any time for puppy advice, or just to chat. We love to hear how the puppies are doing in their new homes. We recommend the Puppy Apartment method for potty training if your pup needs to be inside your home most of the day. This method teaches him/her to potty only in one spot in your home. Puppy Apartment. The Puppy Apartment is perfect when you can not take your puppy outside to potty several times a day. We like this method because it is easy to use, affordable, and the safest for your puppy. A tiny dog can not be let outside unsupervised because of predators and all the other dangers… Please visit the POTTY AND OBEDIENCE TRAINING Page for more info on this fool proof method and for other advice on how to house train your dog. GROOMING: Cockapoos and most poo mixes require grooming once a month but can go two or three months between grooming if you keep them in a puppy or short cut. You will need to brush your puppy at least once a week. You do not have to worry about cleaning up fur from your furniture, or hairs on your clothes, since this is a non-shedding breed. They are also low to dander free which is great if you have asthma or allergies! Please also remember to brush your puppy’s teeth once a week to prevent tooth decay. Visit Our GROOMING PAGE for more info on grooming. Poo Mixes are very nice puppies to have, very playful, but not overly excitable like some small breeds can be. 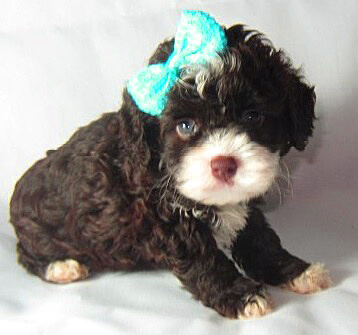 Our Cockapoo and other small Poo mix puppies have very friendly personalities and a desire to please their owners. You are welcome to come visit whichever of our homes has the puppy you want to see, and play with the puppies anytime to see for yourself what nice puppies they truly are. Just call us for an appointment a few days in advance. 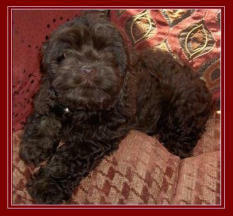 We specialize in puppies that grow up to be therapy service dogs or medical alert dogs. Most of our puppies are perfect for this work since we start training early in life. All our puppies have Super Dog Military Training from an early age. We also go by the rule of sevens, which means we stimulate all senses of the puppy with at least 7 different things: For example sense of touch would be letting them walk and play on seven different surfaces so you do not get a puppy that freaks out on your linoleum floor or a brick road the first time it has to walk on it. 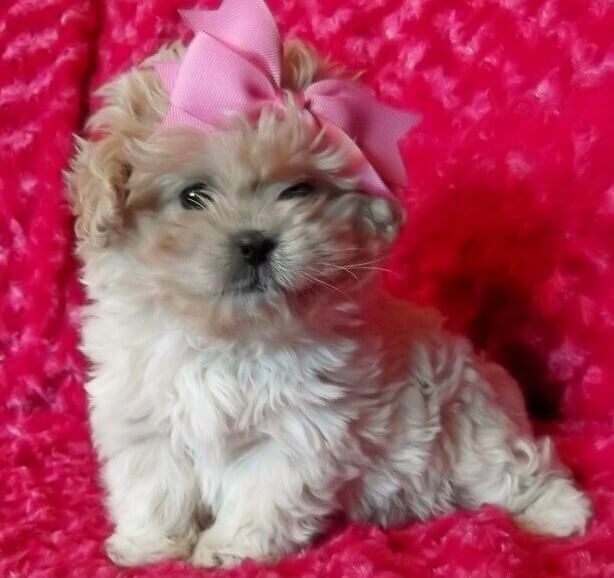 This technique makes them a more well rounded puppy that is easier to train and more relaxed in new environments. . Before shipping your puppy will see a vet before it is transferred to you and if any medical issues are seen at all we will contact you immediately and see if you would like to put your money paid towards another puppy. *I guarantee the health of your puppy, as long as you follow these directions for the puppy’s proper care: 1.Vet check: Take your new puppy to the veterinarian within 72 hours of receiving it. This is required or guarantee is void. Your puppy will come with shots and worming up to date. Puppy must also finish his puppy shot regiment and be on a heartworm preventative or guarantee is null and void. 2.Measure your puppy’s food intake: I will send some food, (Life’s Abundance dry puppy food or another premium puppy food), home with your new puppy. Please have it on hand before you get your puppy. **If you would like to change his/her diet please call me first, so I can explain the proper way to switch from one kind of food to another and to approve the new food. We recommend feeding your puppy Life’s Abundance puppy food for at least the first year of life. Please visit our PUPPY NUTRITION page for info on where to buy this wonderful holistic all natural puppy food. Measure food intake for the first few months to make sure your puppy is eating enough. Your puppy will come with NuVet Vitamins and we ask that you keep him/her on this vitamin for at least the first year of life to help with the immune system and proper development. You can also see info on the vitamins on the PUPPY NUTRITION page. 3. Keep as inside dog until at least 5 months of age: A small body loses heat quickly so at least for the first few months my advice would be to keep your puppy indoors if it is cold outside. 4. Keep puppy kenneled: At night put your puppy in a confined area or crate so it does not over exert itself or get into trouble. This also helps potty train your puppy. It is also my advice to not allow the puppy to over exert itself to the point of hypoglycemia. Please visit the guarantee page to see the health guarantee you will agree to before your puppy is transferred to you. SHIPPING: We are all located near Kansas City. Please See GUARANTEE / PAYMENTS page for full shipping info. In the article below we will be discussing the Different generations of Cockapoos and what the difference is between a F1 Puppy, F2, Puppy and so on… We will also discuss what it means when it has a letter b after the number such as a F1b Cockapoo. The (F) stands for the generation of the dog. All (F) variations are still referred to as a Cockapoo but range widely in size, shape, appearance, intelligence and temperament. Most people prefer Cockapoos for the low to non-shedding coat that is hypo-allergenic and can be suitable for those people with allergies. In my experience even strait coated Cockapoos have this lower shedding and lower dander quality to their coats than a full blooded Cocker. 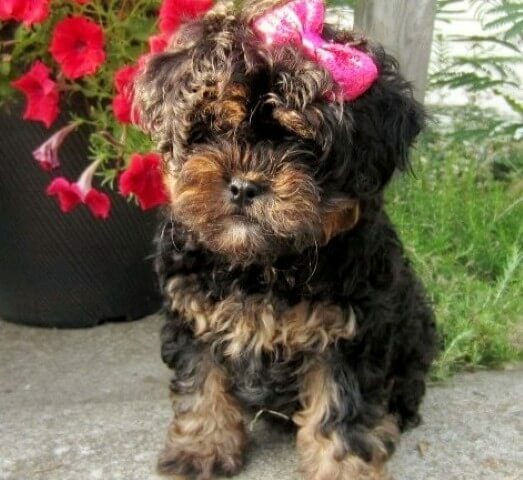 Breeders can get to a Cockapoo in many different ways and each way has its own positive and negative effects on the puppy’s final disposition, and looks.All puppies are cute and it is possible to be too hasty in your search for a new pet. 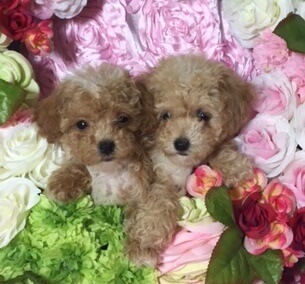 Some breeders will breed any Poodle with any Cocker, or mix of these two breeds and tell you they are sure it will be exactly what you want. Please be aware a Cockapoo can end up with the exact look you want or can have traits that favor one parent over the other when full grown. 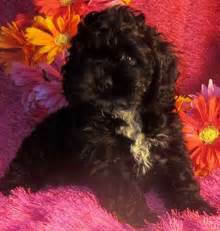 This is seen more in the Cockapoo to Cockapoo breeding or a breeding in which one or both parents have more of one of the parent breeds in them. To know which mix is going to give you what you want you will need to do your homework and make sure your breeder has a reputation for nice looking Cockapoos. Please keep in mind even though a breeder can give you some insight on the final look, personality, and health of your puppy none of us breeders are god and since we are dealing with a hybrid / mix dog there is some, even if very small, chance that even a nice looking fluffy puppy can end up with a Cocker coat, or a pup that looks like it has a short Cocker nose growing up with a longer nose than it was at 8 weeks of age when you received it. This is called genetic throw back and it is not common but does happen on occasion with any dog breed, even full blooded breeds. Most puppies seem to get about 60% of their looks from their mother so make sure both the parents have qualities you like. 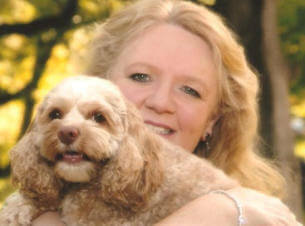 The information in this article is from my experience as a breeder and dog lover of this breed for over 15 years now. It is best to consult the breeder you choose to go with on his/her lines and what past puppies have turned out to be. Most reputable breeders have a certain look they are trying to achieve. 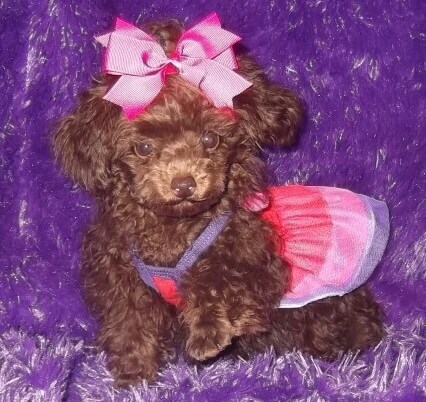 As a Cockapoo breeder we personally breed F1 and F1b Cockapoos to get puppies that have long low set ears, big Cocker eyes, shorter nose, Poodle intellegance, smaller size with a square body frame, and a personality that makes for a wonderful therapy dog and or loyal family pet. Sometimes we will also add in a little Maltese to get more of a teddy bear look. First we will discuss a F1 Cockapoo. The F1 Cockapoo comes from a full blooded Cocker Spaniel and a Full blooded Poodle parent. F1 is considered to have the optimum hybrid vigor, but in my experience I have not seen a difference in health between them. There are 4 different sizes of Cockapoo. Teacup, Toy, Mini, and Standard. 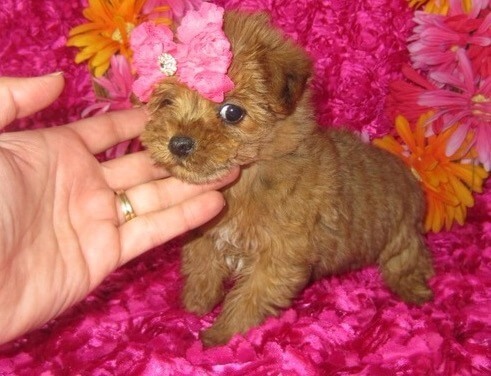 A Teacup or Toy Cockapoo has a Toy Poodle parent. 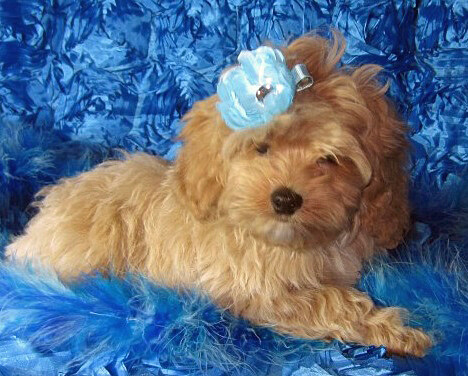 A Miniature Cockapoo has a Miniature Poodle parent. In our experience Toys are not only smaller but can have a shorter nose if a Teacup Poodle or small Toy with the shorter baby doll face is a parent. 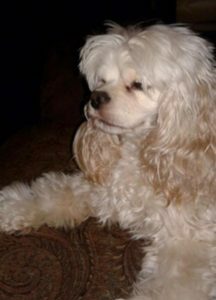 The Miniature Poodle can come in the Old Fashioned: long muzzle and slender legs, pom-pom cut, quite a petite dog or with a shorter muzzle, more stocky build and a calm temperament. 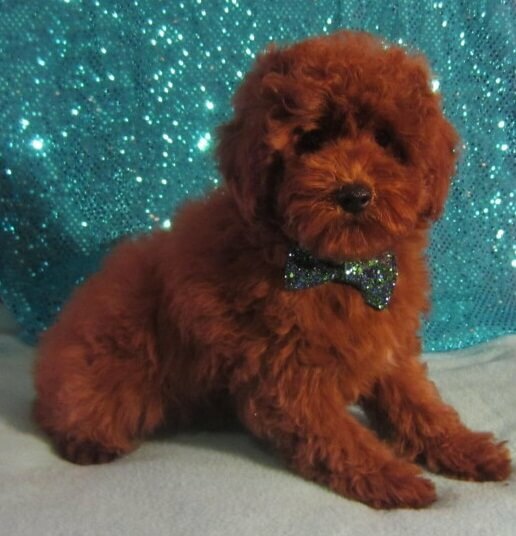 Again the breeder should be using the shortest nosed Poodle and Cocker they can find if a shorter nose is wanted. Also a large factor is which type of the three cocker spaniels make up the other half of the F1 Cockapoo. The American Show Cocker, the English Show cocker and the English Working Cocker are very different in appearance and personality. The (American Cocker Spaniel) is the smallest of the three, has a domed head, deep stop, dropped and long ears and a dense/heavy coat that can grow to the floor as seen in show Cockers. As pets these dogs are usually clipped on a regular basis, and these tend to contribute a squarer frame to the mix, and can also help with shortening the nose. They can create smaller Cockapoos if bred to a small Poodle The (English Cocker Spaniel) is the largest, again has a domed head, deep stop, dropped and long ears and a dense coat that is not as thick as the American. 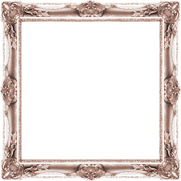 The coat can make a less dense curl or fluffiness to the mix if this is desired. 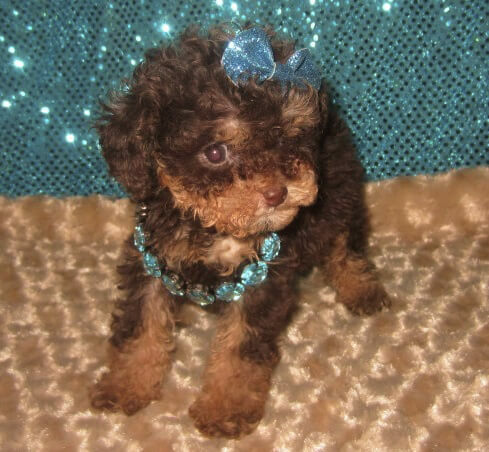 They also have a taller more lean appearance and this can also carry over to the Cockapoo offspring, especially if a Poodle that is also lean and longer legged is used. Finally there is the (English Working Cocker Spaniel). This is an athletic small sporting dog that has a light coat that doesn’t have to be clipped. They have high set ears and square faces. The English working Cocker is bred for working in mind so they can vary in look and size more than the show dogs. They are known for their intelligent, easy trainable, and willing to please attitudes. This breed can be used if a more square face and high set ear is wanted in the offspring. (F2, F3, and so on): F2 Cockapoos come from the breeding of two F1 Cockapoos. If one parent is an f1 and one is an f2 pups will still be classed as f2. 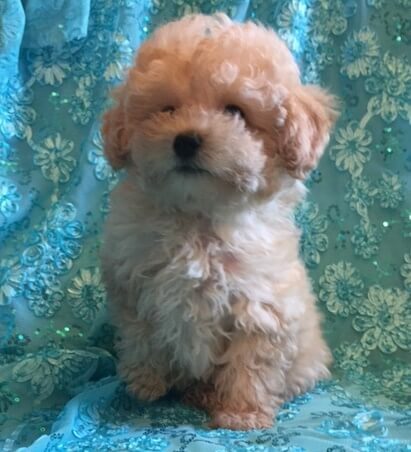 If you see pups advertised as f1b its normally when one parent is an f1 cockapoo and one is a poodle (the b standing for backcross to the poodle). F3 is both parents being f2s and so on. F2, can have potential throw backs that can result in a puppy that favors one breed over the other in looks. 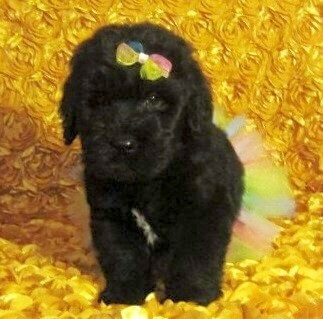 Some breeders will breed a Cockapoo back to a full bred Cocker or a poodle, to give an (F1b). 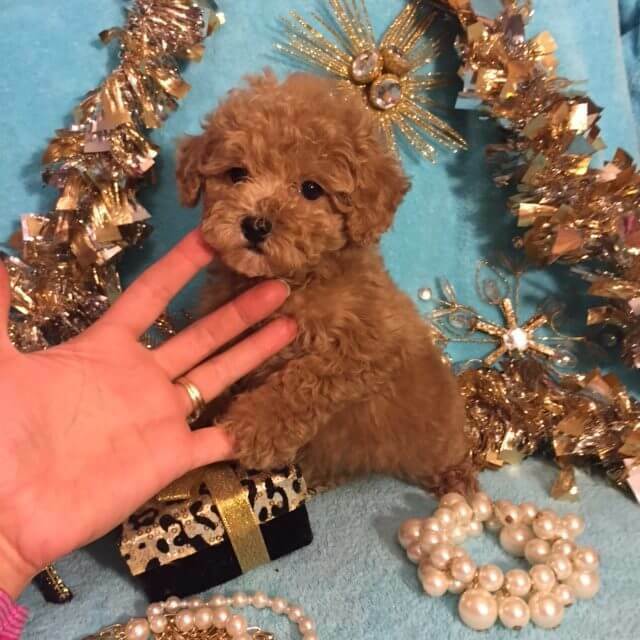 They will do this so the puppies have more characteristics of one breed over the other, For example a smaller size can be accomplished by breeding back to a small toy Poodle. Breeding back to a Cocker can change the coat, so make sure the breeder knows from past siblings what the coat SHOULD be as an adult. With second-generation Cockapoos, two hybrid parents are bred (both with 50% Poodle- and 50% Cocker Spaniel-trait genes). Some second-generation Cockapoos can, and do, look more like Cocker Spaniels or like Poodles. f3 is both parents being f2s and so on. An (F3b) would be the result of breeding a third generation cockapoo to cockapoo dog back to a full blooded Poodle or Cocker. Usually they are bred back to Poodles and not Cockers. 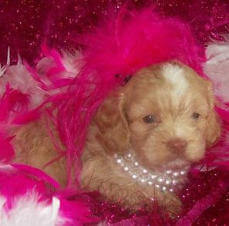 With so many variations I’m sure you will find a Cockapoo that suits your needs and wants in a wonderful future pet. In conclusion: The “F” stands for the generation of the dog. A first generation Cockapoo (F1) is the result of breeding a Cocker Spaniel to a Poodle. A second generation Cockapoo (F2) comes from breeding an F1 Cockapoo to another generation of Cockapoo (if an F3 Cockapoo is bred to an F1 Cockapoo, then their offspring are still F2). To get an F3 Cockapoo, parents must both be F2 or higher. A (b) after the number means a puppy resulting from a Cockapoo of the (generation numbered before the b) bred back to a full bred Poodle or Cocker. We strive to breed for the smaller Teacup, Toy, and Mini sized Cockapoos and Poo mixes. 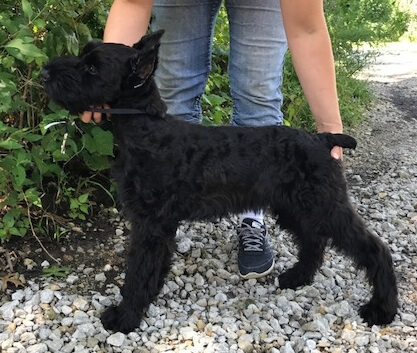 Our Cockers are the American show type and our Poodle studs are 3.5 pds or smaller with a short babydoll face square frame without those to long or to short of legs. We sometimes breed back to a Poodle if we have a very Cocker looking Cockapoo mom we like to use and usually get the same looking pups as the first generation. But we are very specific on what we will breed so we get the look we are working for. Remember subsequent generations can favor one side over the other and the look we are trying to achieve is only seen in the first generation cross, and in the f1b cross. We breed for Cockapoos that look like small Cockers with a fluffy to curly coat. They tend to have long low set ears, big Cocker eyes, shorter nose, Poodle intelligence, smaller size, and a personality that makes for a wonderful therapy dog and or loyal family pet. 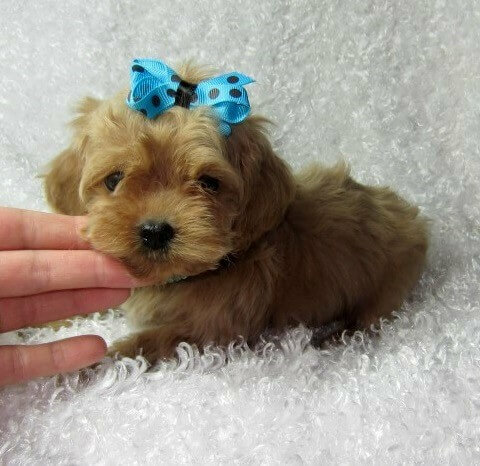 When we add another breed in such as the maltese it is to shorten the ears just a tad, square off the muzzle, and square off the body and of course you get tinier sizes as well, but pups still have that great calm fun loving cockapoo personality.